This Sunday, should Peyton Manning lead the Denver Broncos to a Super Bowl victory, he should retire. Manning should take the opportunity to go out the way that a player of his caliber deserves to end his career. If Manning is able to hoist the Lombardi Trophy on Sunday and win the MVP (which he is a virtual lock to win) then he can go out gracefully, reaching the height of his career in his final season in the NFL. Some people might argue that because he is going to win the MVP that his game is still more than capable of producing another great season and possibly leading Denver to another Super Bowl. Can we be so sure? Denver will lose players to free agency and the stars don’t align forever in the NFL. Denver’s elite receiving core (Thomas, Welker, Decker, Thomas) will be difficult to keep together and Peyton needs each of those respective players. Manning’s arm strength is not what it used to be so his receivers must be able to forge the difficult yards after the catch. The reason they were able to do so this season is because of the variety of weapons they possessed. Since there were four dangerous options, it was impossible for a defense to effectively guard all of them on a given play. Thus, Manning feasted on easy passes to open receivers. If you were to take away one or two of those players, Manning would face the same problems most quarterbacks in the NFL face. Would Manning’s statistics decline in such a situation? Manning’s health is also a concern. Manning has been sacked only 18 times in the regular season, which is truly remarkable considering he attempted 659 passes. Manning’s neck injury is quite serious and the risk of taking too many hits could have a profound impact on his quality of life after football. Could Denver continue protect Manning at that astounding level for another several years? Most importantly, I believe that I speak for the majority of people that do not want to see Manning play too long. I don’t want to see him struggle or go out a shell of his former self. Peyton Manning deserves so much more than that as an elite quarterback. 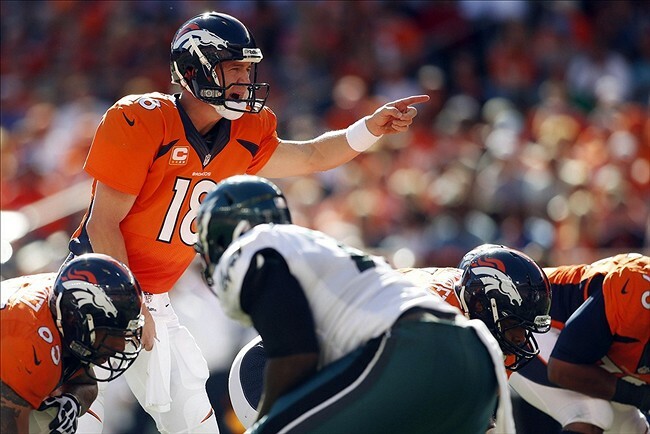 Manning has truly been one of the most influential quarterbacks in NFL history. Manning is a coach on the field. He checks out of plays, makes adjustments, and is almost so great that he makes the difficult look all too easy. He has just set numerous passing records in spite of his arm strength beginning to dwindle. I just don’t want to see him go out in the regular season a few years from now after Denver is no longer a legitimate title threat. If Denver can vanquish the Seattle Seahawks, the timing would be perfect. This would be an opportunity out of a paperback novel, a chance for a man to go out at his best. Peyton Manning will have the chance to leave behind a legacy that won’t be tarnished by too many comeback attempts (looking at you Brett Favre) or a catastrophic injury. Manning shouldn’t retire because he’s too old to chase another title after a disappointing season. When Michael Jordan came back to Chicago after pursuing his baseball career, he was still a top talent. However, when he came back yet again to play with the Washington Wizards it was a disappointment. Jordan was too old to play at an elite level and was voted an all-star by his peers out of respect not because of his play. Looking back would almost everyone agree that Jordan should’ve steered clear of his 3rd comeback attempt with the Washington Wizards? This way, with his MVP award and his Lombardi Trophy in his grasp, Peyton Manning can retire the way we all want him to. Manning will have his face sketched into the metaphorical Mount Rushmore of the National Football League. Manning can go out on his own terms. Manning can end the right way and know that he was the best. The greatest season any quarterback has ever achieved AND a Super Bowl victory? You simply can’t script an ending any better. My script wouldn’t have him in the game.